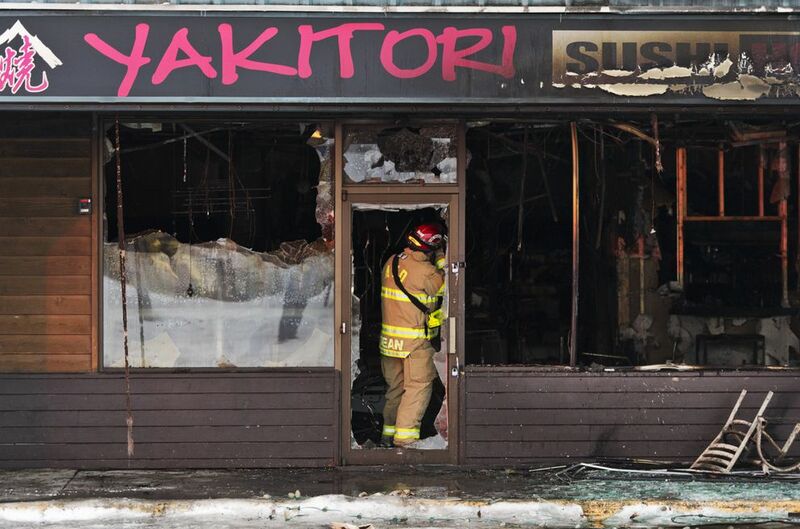 A fire that destroyed a Tudor Road sushi restaurant early Monday morning was likely intentionally set after a break-in, fire officials said. The fire in a strip mall just east of the Tudor and Lake Otis Parkway intersection left Yakitori Sushi House gutted. It started just after a break-in at a noodle business next door, Anchorage Fire Department fire marshal Cleo Hill said Monday afternoon. The fire department became aware of the break-in after the restaurant owner posted security footage showing the fire on Facebook, said Hill, who had not seen the footage. It was later taken down. The fire was reported just before 4:30 a.m., according to AFD. Thirteen units responded. The first firefighters to arrive spotted flames “coming out the window. Fire coming out the front door,” Capt. John Booher said at the scene Monday morning. The restaurant posted a comment on its Facebook page Monday below a news story about the fire: “Sorry about the sad news,” it began before describing a break-in by two men and then promising to reopen as soon as possible. The restaurant is owned by Dan Zhou and Choon Chit Shim, known to customers as Jennifer and Jeff. A weary-sounding Shim, reached by phone Monday, said he had turned over the video to the authorities. He said he didn’t recognize the two men it shows. “I don’t know who they are at all,” he said. 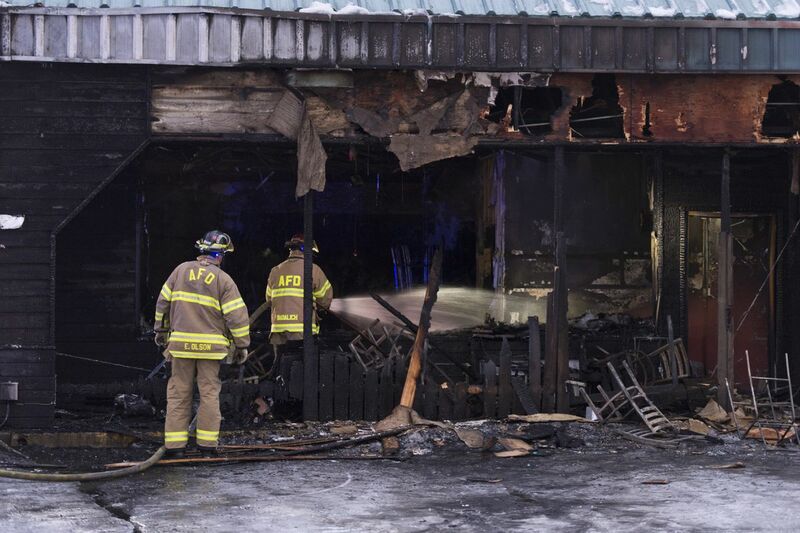 The fire was the fifth to damage or destroy an Anchorage commercial building in a month since the shuttered Sea Galley restaurant burned down in early January. Investigators have said there was a break-in before that fire and found evidence of vagrants inside. But fire officials say there is no evidence that the fires are related -- or even unusually numerous. Fire department statistics show there were three commercial fires reported in January 2016, seven in January 2017, four that month in 2018 and five last month. Another “humongous" fire drew the public’s attention as well, she said. A massive blaze destroyed a partly constructed Midtown hotel on Jan. 26. Developers have said they plan to build what was planned to be a 141-room Courtyard by Marriott. Federal investigators are working with local authorities on that investigation. A fire damaged a self-storage business the same day, according to Hill. Two people were injured in a Jan. 28 fire that damaged the second floor of a building that also houses Brown’s Electric on the Old Seward Highway.